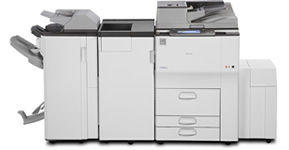 The new Ricoh Aficio MP6002 provides you with a powerful all in one system that offers the very best in performance with top quality results that demonstrate Ricoh's continued development and dominance in this market segment. The Ricoh Aficio MP6002 handles any document workflow/strategy task thrown at it with exceptional ease and gets the job done in a quick and secure manner. The Ricoh Aficio MP6002 offers the following features. For more information on the Ricoh Aficio MP6002 please do not hesitate to call our helpful sales team on 0800 1244 199 or email us.